This blog is turning into a photo album, but my good friend Shawneen, took this picture from the Kenai Peninsula and I think it's great . .. I never used to steer clear of the cold weather, but I have to admit, as I get older .. . hmmm, did I say that . .. I like to look out from indoors by the fireplace. January is the entry to the big political season, and also the forthcoming Fur Rendezvous, so I've been busy attending meet-and-greets of several friends running for office. I don't know why. . . but I won't get into political speeches here on my travel blog. 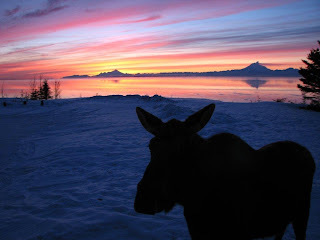 So just enjoy this moose. 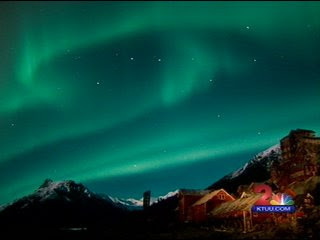 One of the treasures of the winter sky is the Aurora Borealis, or Northern Lights. It's pretty hard to capture these in a photo, as they 'roll' and even the videos don't really show it well, but you get the idea. 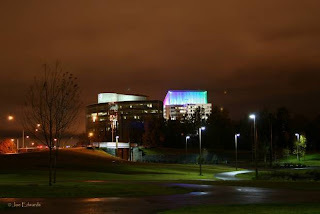 I have to remember to keep looking up because when I'm out that late at night, I usually duck my head and run indoors. If you don't believe me, I'll post a map of the weather here. 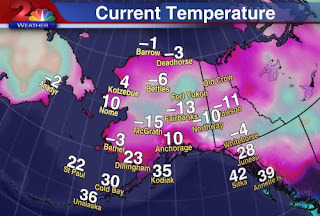 Remember, I'm in Anchorage, not Fairbanks. As winter peaks, and the days get longer, the traditional activites are in high gear. 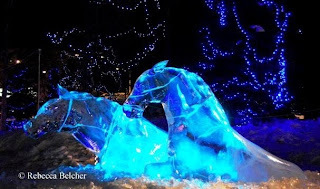 Most notable are the beautiful ice sculptures in our Town Square. This image by Rebecca Belcher was posted in the local paper, and captures the beauty of light refraction. The beauty of Mt. 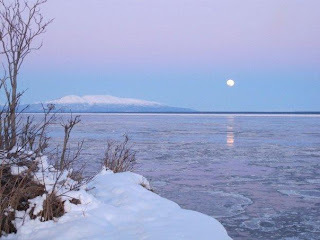 Susitna, or the Sleeping Lady, remains throughout the year, and serves to remind me why I live in this beautiful state. (I only need a reminder when the temperature drops below zero). With all the positives of Alaska, I would be remiss to not mention the sadness we all feel about the earthquake in Haiti last week. By comparison, our 1964 earthquake was minor, and less than a dozen lives were lost. Our prayers are with the people of Haiti, and the rescue teams, as they continue to search and sort. Maybe someday we will figure it all out, as that is the last place I would have thought the earth would open. So I close this week's blog with sadness. Altho' I recognize that all cities change over the years, I don't think any have outdone Anchorage. One of our major couplets is the A-C Street one, but at the south end before the division, C Street has sprouted many new restaurants, hotels, and office buildings. Hidden just south of our library is a back-40 park, named for the donor. Cuddy Park is delightful and here's a picture of their lake. Another big magnet is Kinkaid Park, which is the original homestead of another family that donated this very large undeveloped area just south of ANC airport. The many trails attract international cross-country ski competitions and the building hosts everything from political rallies to weddings. Since it is on a overlook to Cook Inlet, the view from the top of the hill is quite spectacular, and it is also the culmination of the 15-mile planet walk. Now, if it's your pleasure to remain indoors where it's warmer, we do have an ice hockey team. The Anchorage Aces have had championship years, but this isn't one of them, as they are riding the longest losing streak ever, so we won't go into that. 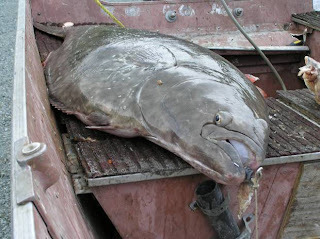 This is NOT fishing season, but I couldn't resist posting this 35 lb. halibut that didn't make it thru the summer. The expression on his face tells it all. Please understand that these images I'm posting on my blog are copied from our local newspaper, and I don't have any written permission to post them, so if this is my last blog, you'll know they got me. . . or I'll write from jail. I still want to encourage you to plan to visit Alaska, and remember to take out some of my travel insurance before you leave! Need I display some more wildlife shots to show you why?